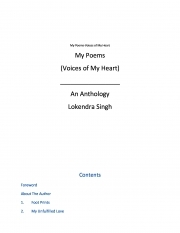 Description of "My Poems (eBook)"
This present book is a collection of my poems which have been published in different magazines at different times. This anthology comprises themes appealing to both young and old. I would like to dedicate this poem to all my poem readers. I am thankful to Inspiration unlimited- e magazine, Nachiketanjali magazine, poetry soup, HighonPoems and Poem Hunter to publish my poems as they motivated me to write poems more and more. My special thanks to my family, which always inspired me to write poems and poet Arundhati Subramaniam, who inspired me through her mails as and when I felt stuck in my own dilemmas. Lokendra Singh hails from holy city Ajmer. He is, an aspiring writer and a poet, a postgraduate in English Literature and a central Government employee, a spiritual seeker and an ardent reader, currently based in Lucknow. He loves reading novels of Amitav Ghosh, Jhumpa Lahiri, Mahesh Dattani, Girish Karnad, and Manju Kapur and his favorite poets are Sri Aurobindo, Rabindra Nath Tagore, Swami Vivekananda, John Keats, William Wordsworth, A.K. Ramanujan, Arundhati Subramaniam, Tishani Doshi and Chandrama Deshmukh. He was inspired by poetess Arundhati Subramaniam to write a poetry. His poems and write-ups also published in several print and online publications, including websites like WWW.POEMHUNTER.COM, WWW.POETRYSOUP.COM, WWW.FORWARDPOETRY.CO.UK, WWW.HIGHONPOEMS.COM and magazines like Inspiration Unlimited" and "Nachiketanjali". One is the number one inspirational magazine and another is one among the top twenty spiritual magazine of India, according to speaking tree. Reviews of "My Poems (eBook)"